Methods of Irrigation - A Complete Guide. Methods of Irrigation – A Complete Guide. There are five basic methods of irrigation (flooding, furrow irrigation, trickle, sprinkling, and sub irrigation). Numerous subclasses exist within each of these basic methods. You’ll learn all the above mentioned irrigation methods in details here. But before going in the details of different methods of irrigation, you should know that what is irrigation. Watch the video below for a more in depth view that what is irrigation? This method of irrigation consists in turning the water onto natural slopes without much control or prior preparation. It is usually waste of water, and unless the land is naturally smooth, the resulting irrigation will be quite uneven. Wild flooding is used mainly for pastures and fields of native hay on steep slopes where abundant water is available and crop values do not warrant more expensive preparations. Controlled flooding may be accomplished from held ditches or by use of borders, checks, or basins. Flooding from field ditches is often adaptable to lands with topography too irregular for other flooding methods. It is relatively inexpensive because it requires minimum of preparation. Water is brought to the field in permanent ditches and distributed across the field in smaller ditches spaced to conform to the topography, soil, and rate of flow. Under ideal conditions, the ditch spacing and flow rate should be such that the water will just infiltrate in the time it is flowing across the field. If the flow is too rapid, some of the water will not have time to infiltrate and surface waste will occur at the lower edge of the field. If flow is too slow, excessive percolation will occur near the ditch, and too little water will reach the lower end of the field. The border method of flooding requires that the land be divided into strips 30 to 60 ft. wide and 300 to more than 1000 ft. long. The strips are separated by low levees, or borders. Water is turned into each strip through a head gate along one of the narrow sides and flows downhill the length of the strip. Preparation of land for border strip irrigation is more expensive than for ordinary flooding, but this may be offset by a decrease in water waste because of the improved control. Check flooding is accomplished by turning water into relatively level plots, or checks, surrounded by levees. If the land is initially level, the plots may be rectangular but with some initial slope the checks will usually follow the contours. Check flooding is useful in very permeable soils where excessive percolation might occur near a supply ditch. It is also advantageous in heavy soils where infiltration would be inadequate in the time required for the flow to cross the field. In check flooding the check is filled with water at a fairly high rate and allowed to stand unit the water infiltrates. The basin flooding method is check flooding adapted to orchards. Basins are constructed around one or more trees depending on the topography, and the flow is turned into the basin to stand until it infiltrates. Portable pipes or large hoses are often used in place or ditches for conveying water to the basins. 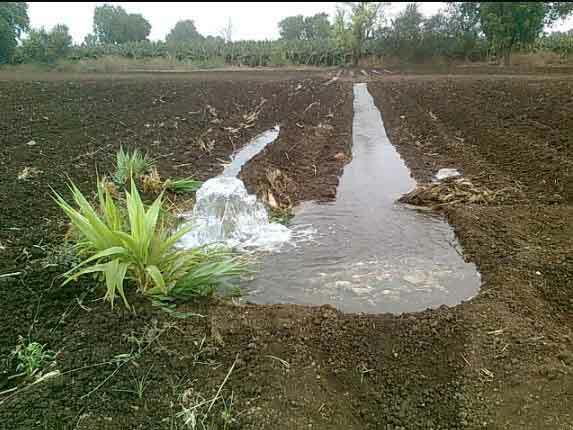 This method of irrigation is widely used for row crops, and small furrows, called corrugations, have been used for forage crops such as alfalfa. The furrow is a narrow ditch between rows of plants. …and evaporation losses are correspondingly reduced. Furrow irrigation is adapted to lands of irregular topography. Customarily the furrows are run normal to the contours, although this should be avoided on steep slopes where soil erosion may be severe. 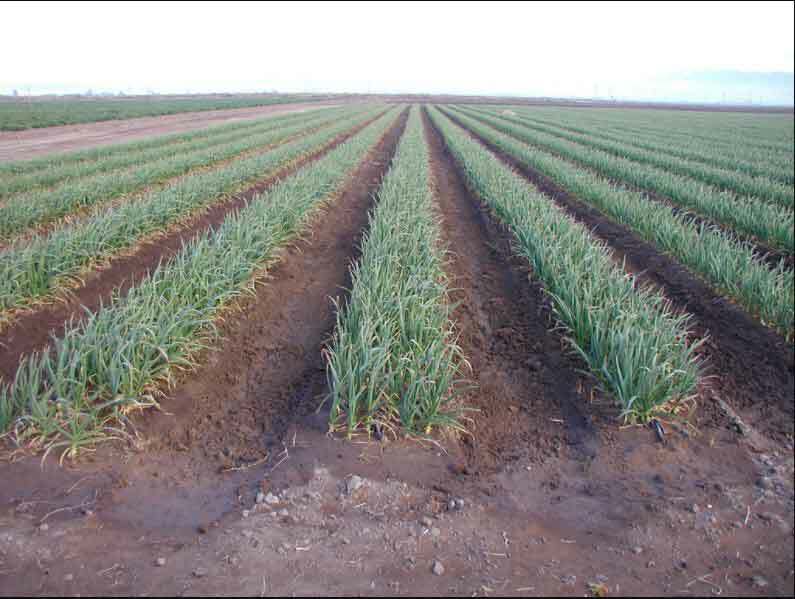 Spacing of furrows is determined by the proper spacing of the plants. Furrows vary from 3 to 12 inches deep and may be as much as 1500 ft. long. Excessively long furrows may result in too much percolation near the upper end and too little water at the downslope end. Water may be diverted by an opening in the bank of the supply ditch, but many farmers now use small siphons made out of 4 ft. lengths of plastic or aluminum tubing about 2 inches in diameter. These siphons are easily primed by immersion in the ditch and provide a uniform flow to the furrow without the necessity of damaging the ditch bank. The development of lightweight pipe with quick couplers resulted in a rapid increase in sprinkler irrigation after World War II. Sprinkler irrigation offers a means of irrigating areas which are so irregular that they prevent use of any surface-irrigation methods. By using a low supply rate, deep percolation or surface runoff and erosion can be minimized. Offsetting these advantages is the relatively high cost of the sprinkling equipment and the permanent installations necessary to supply water to the sprinkler lines. Very low delivery rates may also result in fairly high evaporation from the spray and the wetted vegetation. 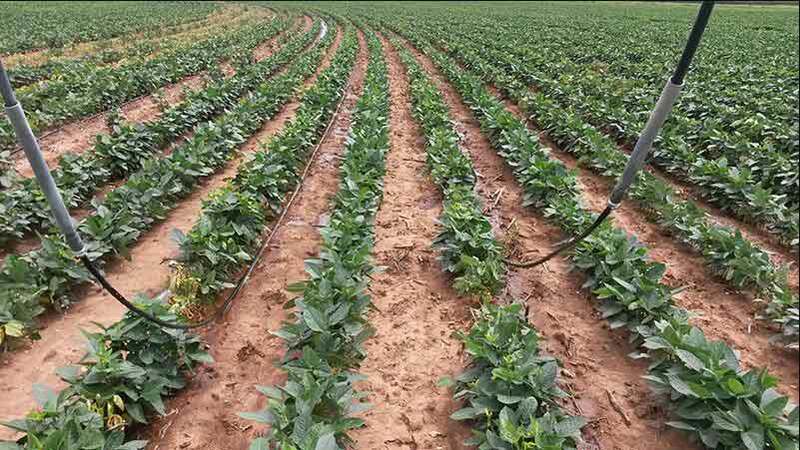 In recent years, high labor costs for surface irrigation have increased the attractiveness of sprinkler irrigation. an increase of 26 percent, while sprinkler use rose from 3.7 million to 7.6 million acres, a 130 percent increase. Sprinkling may be accomplished with fixed perforated pipe, rotating sprinkler heads, or fixed sprinkler heads. It is impossible to get completely uniform distribution of water around a sprinkler head, and spacing of the heads must be planned to overlap spray areas so that distribution is essentially uniform. virtually eliminates all evaporation from soil, deep percolation, and runoff, and leads to very high efficiency in the use of water. Because of low water use, soil salinity problems are reduced. The technique of trickle irrigation was developed in Israel. In a few areas soil conditions are favorable to sub irrigation. The required conditions are a permeable soil in the root zone, underlain by an impermeable horizon or a high water table. 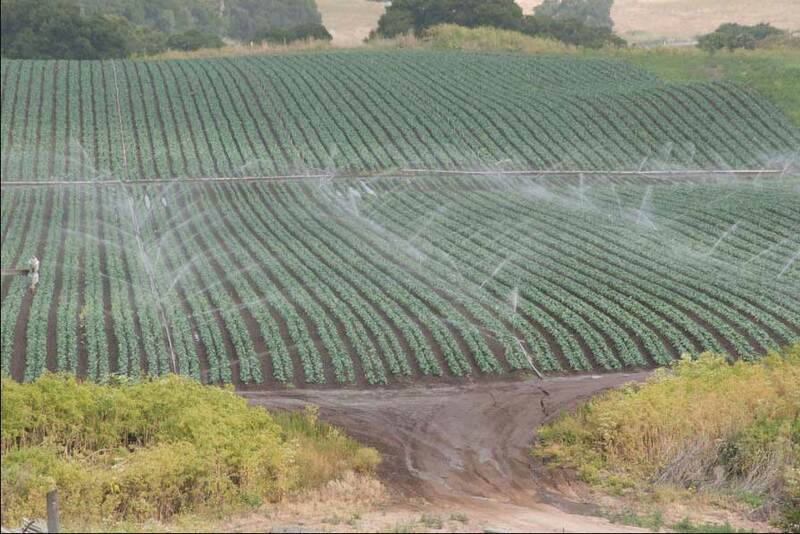 such that water from the capillary fringe is available to the crops. Low flow rates are necessary in the supply ditches; and free drainage of water must be permitted, either naturally or with drainage works, to prevent water logging of the fields. The irrigation water should be of good quality to avoid excessive soil salinity. Sub irrigation results in a minimum of evaporation loss and surface waste and requires little field preparation and labor. 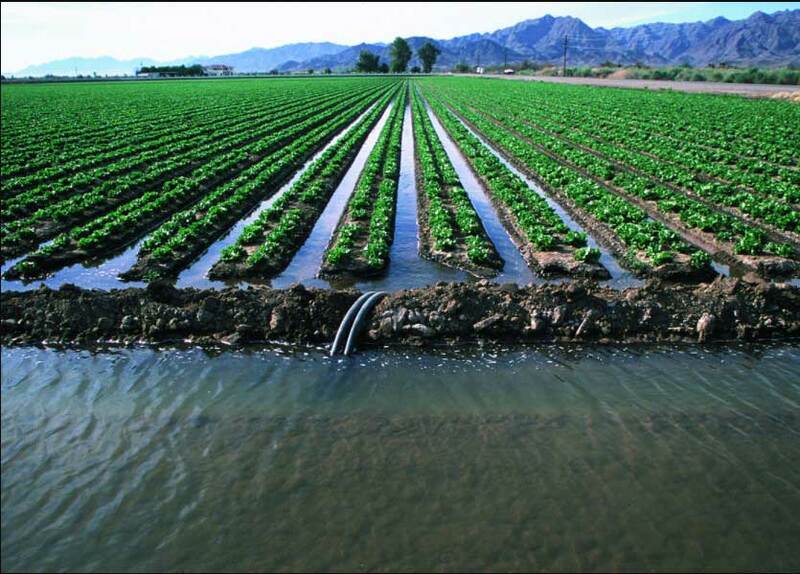 Sub irrigation has been employed in the Egin Bench project, Idaho; in Cache Valley, Utah; in San Luis Valley, Colorado; and in the delta of the Sacramento and San Joaquin Rivers in California. Read More: Canal Head Works – Its Function, Components, Site Selection. Thanks for reading this article ( Methods of irrigation ). Please, don’t forget to share it.